From commercial construction to hospitals, schools and facilities maintenance applications, the RS Series can be used virtually anywhere. This high-performing electric scissor lift has a simple but rugged design, using passive pothole protection to reduce service calls and traverse varied, cluttered terrain. With zero emissions and industry-leading duty cycles, you can do more on the job site with an RS Series machine in your fleet. Click here to learn more about the RS Series. According to FMI, a leading engineering and construction consulting firm, CPIP (construction put in place) growth rates are expected to be slightly ahead of the GDP in 2014. FMI predicts that residential CPIP, health care CPIP, sewage CPIP and manufacturing will grow in 2014 while transportation construction will slow. The Associated General Contractors of America announced that construction employment hit a 50-month high, adding 11,000 jobs in October. This growth marks the fifth consecutive month of construction sector job gains. Shifts in patient preferences as well as shifts in the way healthcare is delivered as a result of the Patient Protection and Affordable Care Act may be influencing an increase in healthcare-related construction projects as providers build additional offices and expand their services to include out-patient facilities. Reach, power, control and comfort. 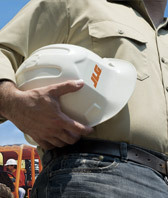 When you climb into a JLG® telehandler, you have complete control of your productivity. From the comfort of a spacious cab, you can flex the muscle of a 12,000 lb maximum capacity, reach heights of up to 55 ft and toggle through three distinct steering modes. With a telehandler on your side, you can maneuver through hectic environments and conquer the toughest worksite challenges so that you and your team can reach performance goals. 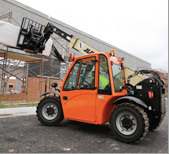 Versatile attachments allow you to tailor your telehandler to the job. The ultra-strong boom lets you lift higher and farther with confidence. Side-mounted engines give you more visibility while providing easy-access for maintenance. Front wheel, all-wheel and crab steering modes improve maneuverability. The spacious comfortable cab provides 360-degree visibility while reducing operator fatigue. Single joystick boom lift control allows for more precise positioning. The Tier 4i engine reduces environmental impact while increasing fuel efficiency. With an evolving economy shaped by significant forces like the government shutdown and the Affordable Care Act, 2013 has been an unusual year for nearly every sector, the construction industry included. With multiple influences shaping the direction of construction, we invited two experts—Nathan Medcalf, Editor of Equipment Journal, and Larry Stewart, Editor of ForConstructionPros.com—to reflect on 2013 and to offer their informed predictions of what 2014 holds for the construction industry. Click here to read their predictions.